What’s the price you’ll pay for happiness? This is a key question in playwright Frances Ya-Chu Cowhig’s riveting re-working of 13th Century Chinese play The Injustice Done to Dou E by Guan Hanqing. Snow in Midsummer is a poignant mother-daughter drama, with a passionate gay love story thrown in, the supernatural, Buddhist rituals and Ruth Chan’s thumping techno. 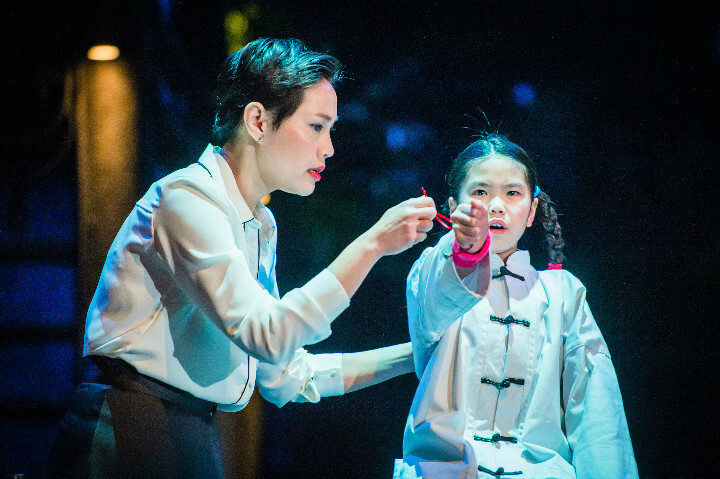 Set in New Harmony, a remote factory town in modern-day China, it opens with 23-year-old widow Dou Yi – Harry Potter actor Katie Leung – selling lucky sculptural origami Lotus tree leaves to members of the audience, before she’s framed for murder. (A generous lady in the front row gave her £5 for two – returned to her in the interval). On death row: Injustice, love and loss are central themes. 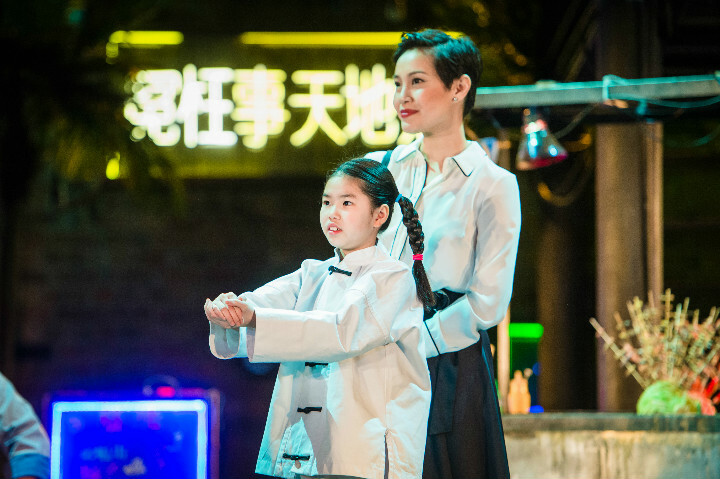 The ghost of innocent Dou Yi, who is executed for killing factory boss Master Zhang, returns to haunt six-year-old Fei-Fei – the adopted daughter of high-flying single businesswoman Tianyun, the new factory owner. Tianyun thinks this “magical snow-girl” is another of her daughter’s imaginary friends. “Her first was a unicorn panda,” she tells Madam Wong. As the mother of a daughter a similar age to Fei-Fei I could totally relate to Tianyun (obv without her money and fab designer wardrobe). The scene where Fei-Fei goes missing gave me a real jolt – that horrible feeling of hysteria when momentarily losing a child from your sight. Actress Wendy Kweh looks super glamorous throughout. In one scene, she wears an immaculate all-white trouser suit – not many people can carry that off. 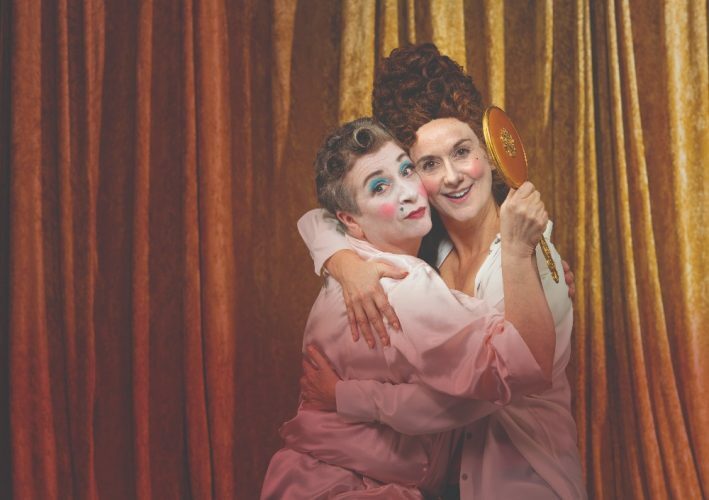 It’s great to see so many strong female characters at the heart of a play. 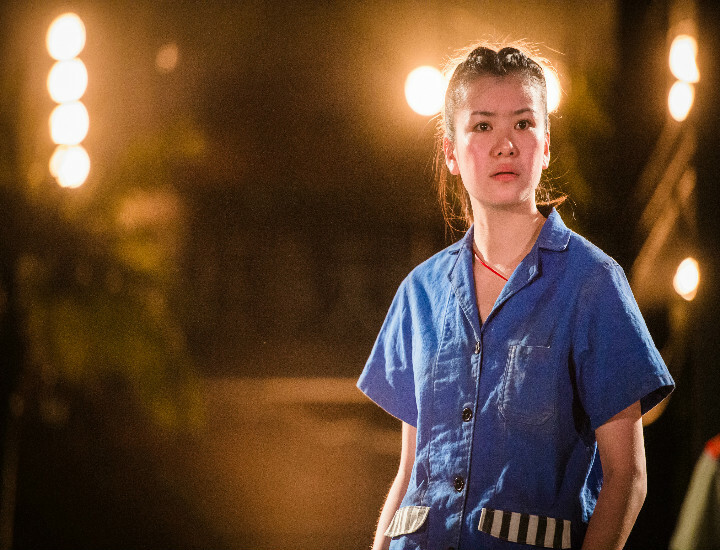 Katie Leung, with her lovely Scottish lilt, gives an impassioned performance, as the angry, defiant feminist ghost. 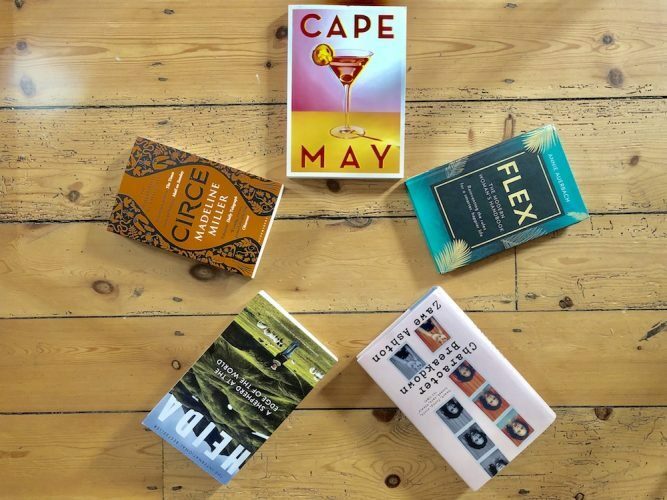 As a sign of her innocence she curses the factory town, snow covers her dead body in June – hence, the title – and there’s a three-year drought. Dou Yi’s spirit cannot rest until her name is cleared and her heart is laid to rest. 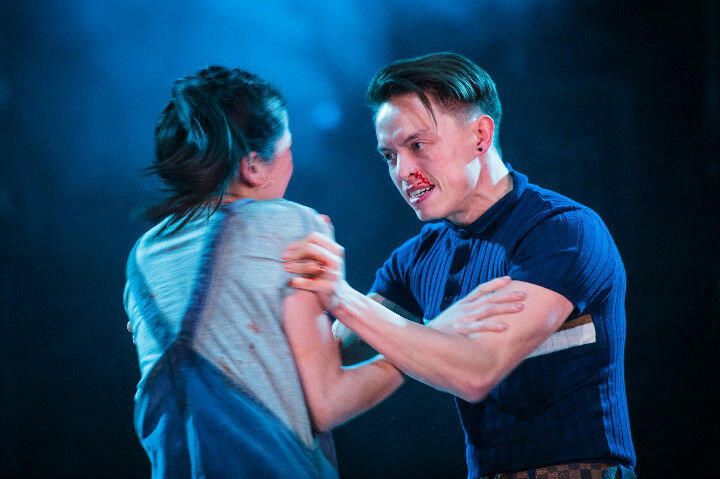 Master Zhang’s son Handsome, brilliantly played by Colin Ryan, whom you may recognise from the RSC’s 2013 Christmas production, Wendy and Peter (as one of Wendy’s brothers), is madly in love with boyfriend Rocket who he’ll move “heaven and earth for”. Literally. 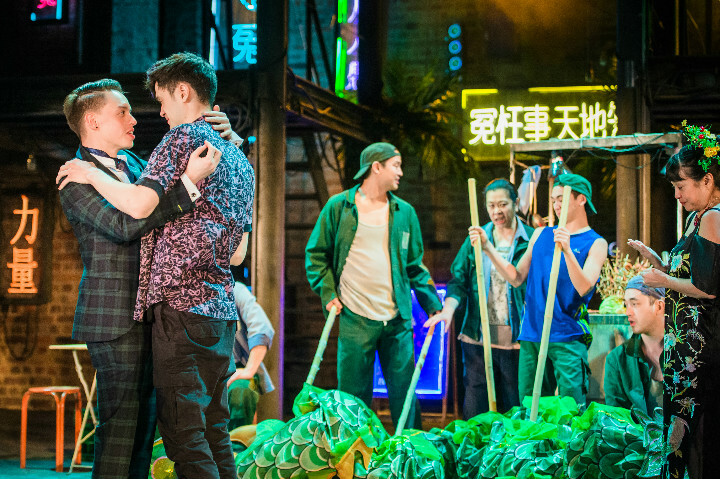 Handsome proposes to Rocket in a vibrant scene where The Swan is transformed into Nurse Wong’s rave bar with flashing neon Chinese street signs, electronic beats, a masked DJ in the rafters and celebratory Chinese Dragon dance. Handsome also sports a very nice line of dapper fitted suits like this tartan one, and slip-on shoes. My friend and I had been allocated such good seats – in the second row – that we were in eyeline of all the actor’s feet and developed some serious shoe envy, even little Fei-Fei’s metallic trainers were stylish. 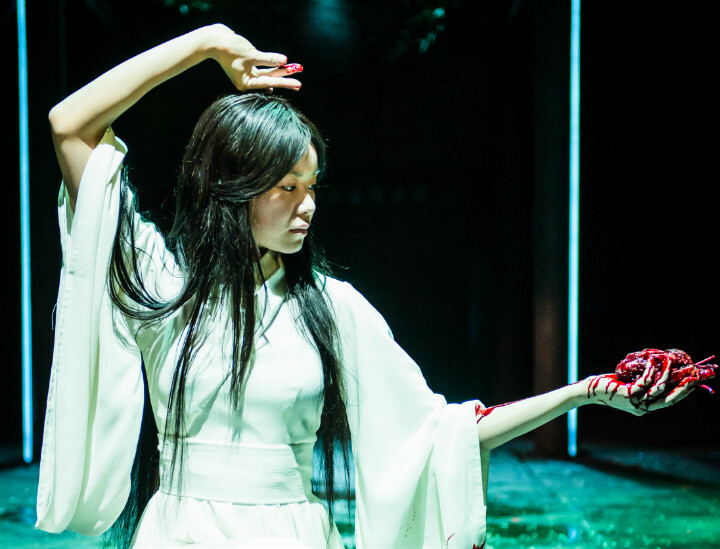 Justin Audibert’s raw, edgy production excels at depicting the supernatural side of this haunting Chinese ghost-horror story – the darkness and flickering lights are genuinely quite unnerving. 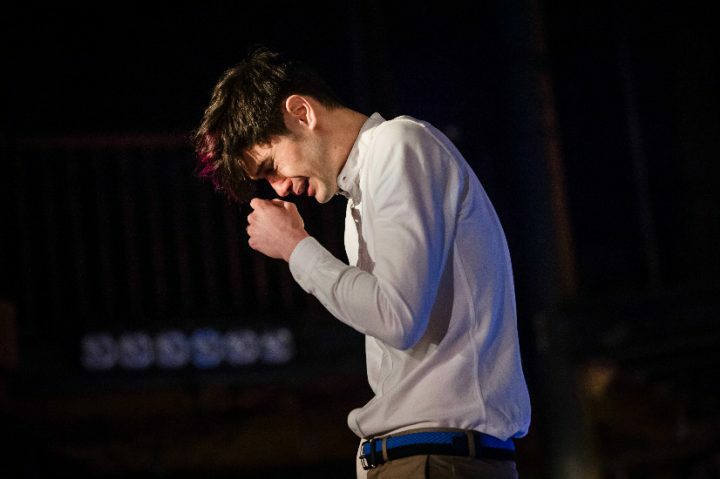 As in Shakespeare the comedy comes from the minor characters – the factory workers and the soldiers who execute Dou Yi. There’s lots of ‘banter’, selfies and a funny sexting scene. 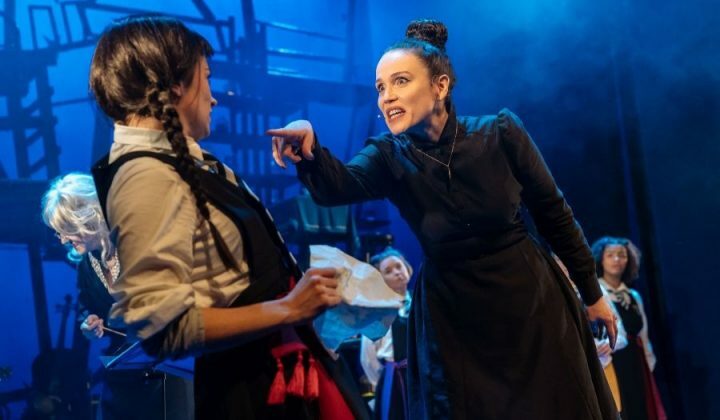 The set’s very cool too – I love the multi-colour neon lights, the atmospheric Buddhist altars covered in red Gladioli and the stunning snow scene. There’s a multitude of twists-and-turns in the second half that will keep you on the edge of your seat. 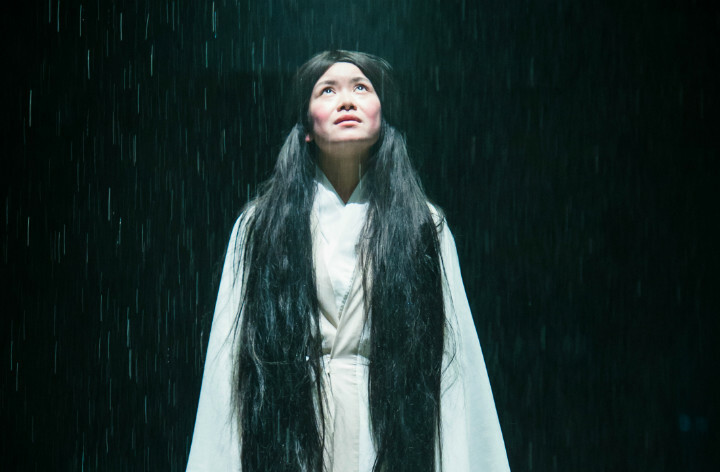 Excitingly, Snow in Midsummer is the first in the RSC’s Chinese Classics translation project and is performed by an excellent entirely East-Asian cast. Adorable Emily Dao who plays Fei-Fei is a natural. Unmissable heart-breaking drama. 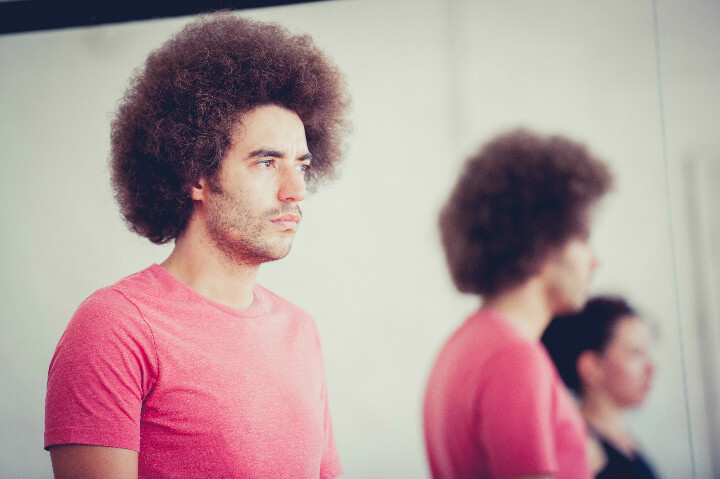 It’s a very short run so make sure you book soon, as it ends on Sat March 25.